There’s a special kind of genius that makes you transform any game system into a live visual tool. Whatever that force is, it’s strong with pikilipita. He’s build VJ software for the Nintendo Game Boy Advance and Game Park GP2X as well as the PlayStation 2, all released free. Now, he adopts the Korean game console Caanoo for a new title, Super Pikix. Here, we get a first look and talk to its talented creator. Tap the analog controls (ah, tactile feedback) or touch the screen, and video clips respond with slick effects. The interface is stunningly elegant, with minimal layers atop the output. It’s definitely a software achievement, but pikilipita’s own aesthetic shines, too, from the interface design to the content, as you can see in the video. You need a special video format called kouky, but he’s got all the info you need on this site to make this a entirely viable VJ solution. 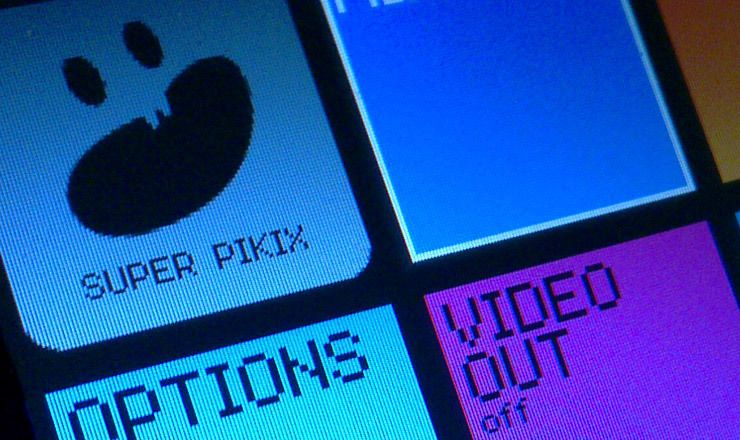 With Android, while powerful, presenting some limitations for hackers – and no analog video output on many devices – the Super Pikix is a nice alternative for people who want mobile open source visuals and still love their analog game controls. The creator explains his thinking. CDM: Why did you choose this particular console? 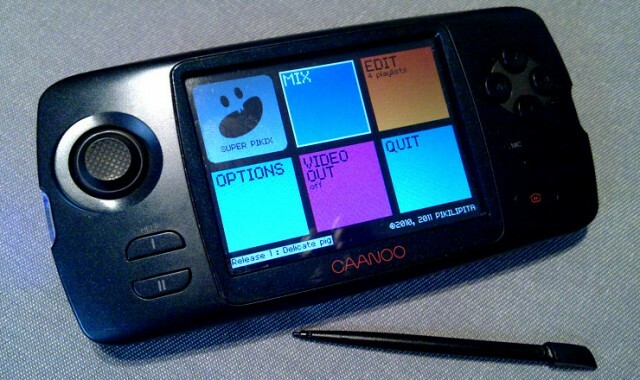 The Caanoo, is the latest device from the manufacturer Gamepark Holdings as the successor of the GP2X console. The GP2X had two main issues: short battery life & low quality PAL/NTSC video-out. Since the Caanoo had adressed those, it seemed natural to move the portable VJ software Pikix to this new platform. Have you considered any others platforms? How do you personally use this live? What’s your rig / performance approach? I make the most of the “mobile” possibilities of the console… Will have a video report soon of my latest show as part of a duo of performers.